Originally launched in the Netherlands, this magazine is a 'mindstyle' title that is aimed at contemporary women aged between 29 and 55. 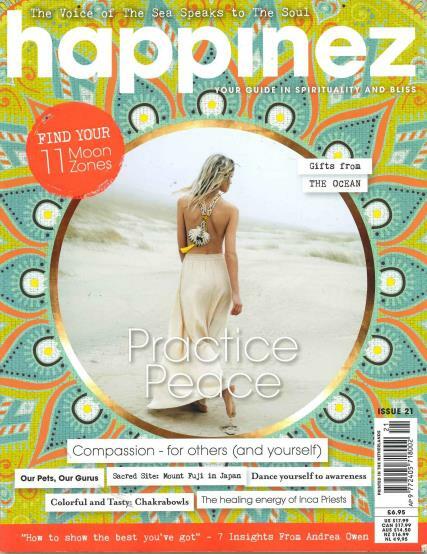 Buy a single copy or subscription to Happinez magazine. The title includes features on a wide spread of topics based around wisdom, psychology and spirituality. Buy this publication now with Unique Magazines! First time purchase;issue 7. A beautiful magazine. Interesting informative topics, and stunning photography. Excellent use of mood enhancing colour and imagery throughout. Simply scrumptious! I like the fact that the magazine covers the subjects I am interested in and is relevant to my lifestyle. Also like the artistic layout. At last - a spiritual magazine for adults!